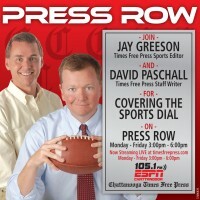 Join David Paschall and Jay Greeson from the Chattanooga Times Free Press along with Wells Guthrie every weekday afternoon for an in-depth look at local, regional and national sports. David Paschall is a sports writer for the Times Free Press. He started at the Chattanooga Free Press in 1990 and was part of the Times Free Press when the paper started in 1999. David covers University of Georgia football, as well as SEC football recruiting, SEC basketball, Chattanooga Lookouts baseball and other sports stories. He is a Chattanooga native and graduate of the Baylor School and Auburn University. David has received numerous honors for his journalism, including various Tennessee state sports writing awards. In addition, he is a former voting board member of the now defunct Harris Interactive College Football Poll and currently serves on the voting board for the Heisman Trophy; he also serves on the voting board for the Biletnikoff and Lombardi awards. He is a past Southern League writer of the year, and a former board member of the Football Writers’ Association of America. Jay Greeson was named the Sports Editor of the Times Free Press in 2003 and started with the newspaper in May 2002 as the Deputy Sports Editor. Jay moved into a general columnist role with the paper in February 2015 and writes three columns a week in A2 and two in the sports section. He was born and raised in Smyrna, Ga., and graduated from Auburn University before starting his newspaper career in 1997 with the Newnan (Ga.) Times Herald. Stops in Clayton and Henry counties in Georgia and two years as the Sports Editor of the Marietta (Ga.) Daily Journal preceded Jay’s move to Chattanooga. He has won local, state, regional and national awards as a writer, designer and section editor and was part of a TFP team that won a 2011 APSE award. Jay and his wife Kathleen were married in 2004 and have a son, Lee born in 2007, and a daughter, Madeline Ray born in 2010. Wells Guthrie was named Program Director of ESPN 105.1 The Zone in late 2011. He began his career in radio as an intern at the station a year earlier, before quickly moving into a producer role. During 2010, Wells served as Executive Producer of The Nick Bonsanto Show and produced play-by-play broadcasts for both UTC athletics and the Chattanooga Lookouts, who at that time, was the AA affiliate of the Los Angeles Dodgers. Since then, Wells has co-hosted the station’s afternoon-drive program, In The Zone with Jim Gumm. In September of 2013, the show was re-branded to incorporate Wells’ name, Gumm & Guthrie. As of 2015, Wells continues to serve as Program Director of ESPN 105.1 The Zone. Wells currently produces content for the station’s new afternoon-drive show, Press Row. He also serves as a fill-in host on the station. Wells is a native of Fairfax, Virginia, a suburb of Washington D.C. He played baseball at Virginia Wesleyan College in Norfolk, VA before transferring to his parents’ alma mater, the University of Tennessee Chattanooga, to finish his degree in Sports Administration.